Evoluent™ VerticalMouse™ and Mouse Friendly™ Keyboards. The design of the Evoluent improves comfort and control when mousing. The patented shape supports your hand in a relaxed handshake position while allowing the thumb to rest in a naturally contoured notch. This positioning eliminates forearm twisting and minimizes the effort required to use the mouse. The mouse remains stable when pressing buttons because the thumb naturally opposes the finger movements. The classic horizontal design twists the arm. A regular mouse requires your forearm to twist away from its natural position, which can reduce blood flow, put muscles in awkward positions and increase the rate of fatigue and for many, discomfort and pain while mousing. The grip is the same as an ordinary mouse, just turned sideways, and the buttons are operated by the same fingers. There is virtually no retraining necessary. The mouse does not move sideways when clicking with normal force. Pointer control is as accurate as any other high-quality mouse. Just as not all hands are the same size, nor should mice be. 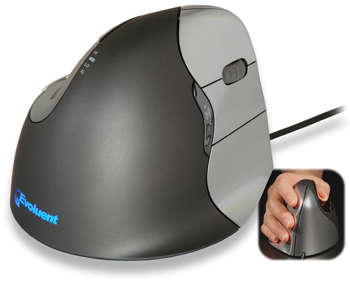 The Evoluent VerticalMouse 4 is available in two sizes for Right hand users. Sizing information is available here. Currently the Left hand VerticalMouse 4 and VerticalMouse 4 Bluetooth (for Mac) models are available only in the Regular size. Pointer Speed Indicators: Top mounted LEDs show through the housing on the chrome thumb rest to indicate selected pointer speed from extra low to high. Backlit Evoluent Logo: A purely cosmetic feature which adds to the lustre and modern look of this mouse. The illumination turns off when the system is in sleep mode to conserve notebook battery power. Useful and Intuitive Driver: Mouse Manager for Windows provides extensive configuration options and is still easy to use through a simple and intuitive interface. Application Dependent Buttons: Create customized button programming which automatically takes effect depending on which application is active. Shape: This 4th generation model features Improved softer contouring for a more comfortable fit. The slightly greater height better accommodates larger hands while improved contours maintain a comfortable grasp locations for a wide range of hand sizes. This, combined with a deeper and slightly angled indentation for the thumb, reduces the pressure in the web of the hand. Finger Flange: The significantly larger finger flange prevents fifth finger from dragging on desk. TWO Thumb Buttons: A new bottom thumb button provides greatly extended functionality when used with the available driver. Design: Improved sensor coupled with the light button activation force for which the Evoluent is known. Button actions and vertical scroll wheel movement are smooth, consistent and precise. Improved contours provides greater comfort and a more relaxed grip. Relaxed Handshake Position: The ergonomic contoured shape supports the hand in a natural handshake position that eliminates forearm twisting. Users employ the same familiar grip as with an ordinary mouse, but in a vertical orientation, so almost no retraining is needed. Clicking the mouse buttons does not result in unwanted movement because the thumb naturally opposes other finger movements. Contoured and Textured: The contoured black portion of the body where one holds the mouse has a polyurethane coating, allowing the user to have complete control of the mouse just by resting one's hand on it — practically eliminating the need to grip the mouse. Light Tactile Buttons: The buttons on the VerticalMouse take about half the force of traditional mice to click, so fingers won't get tired with the high frequency of clicking required in today's computer applications. The button force is light for easy clicking, but still retains sufficient tactile firmness to avoid accidental actuation. 6 Buttons: The VerticalMouse provides a total of 6 buttons. Two thumb operated buttons and 3 finger operated buttons are provided, with the scroll wheel providing a sixth button. Scroll Wheel: Grooved soft rubber with tactile detents ensures smooth scrolling. Auto Click: Automatically perform a single or double click by pausing the pointer. The time delay before activation is adjustable. Click Lock (or Drag Lock): Press and hold a button momentarily to simulate continued pressing without holding down the button. The time delay before activation is adjustable. Break Reminder: Set up visual and/or audio alerts to remind you to take a break. Compatibility: Also see the compatibility table. PC: Includes drivers for Windows XP, Vista, & 7 in 32 bit and 64 bit versions for programming all 6 buttons. (Fixed button functions without a driver. Evoluent Mouse Manager available for OS X 10.5 and OS X10.6 (and newer) enables programming for all 6 buttons. Shareware drivers listed on the Evoluent website may be also be used to program the buttons. Basic 2 button functionalityin OS X or newer without a driver. Standard: Silver buttons, grey housing, blue light for Evoluent logo, green DPI setting indicator. Small: Purple buttons, black housing, green light for Evoluent logo, red DPI setting indicator. Home Ergonomics of the Evoluent VerticalMouse 4 Product Details Which Size?